Less than a year after turning heads with its Tourbillon Ottanta, developed and manufactured for Pininfarina's 80th anniversary, Bovet presents the Chronograph Cambiano Edition 2011. The style is the same, with characteristic screws and oscillating weight. A succession of curves and sharp angles connect the different volumes for an architecturally rich timepiece, structured by contrasting and meticulously executed finishes and surface treatments. 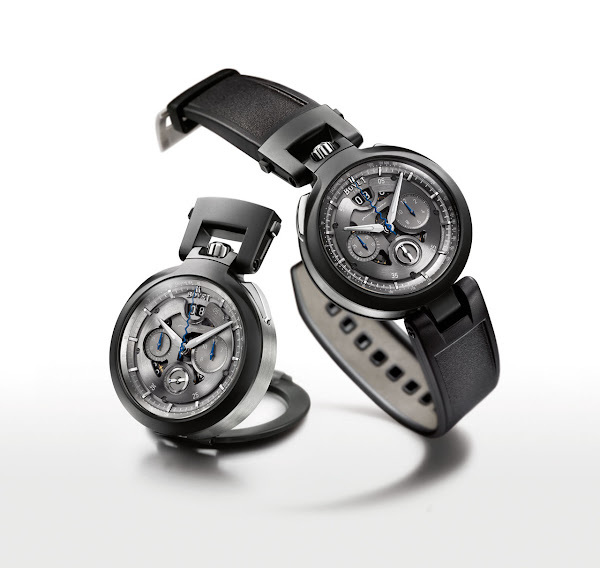 The Amadeo® convertible case allows it to be used as a wristwatch, a small clock, a pocket watch or a sports counter. A successful merging of the worlds of cars and Haute Horlogerie, underscored by technical accomplishment and refined style.